Resin Bond Diamond Wheels of all types, sizes, shapes and abrasives. Standard grinding wheels can ship from stock. Custom Resin Bond Diamond Wheels and abrasive products can be manufactured promptly. Diamond grinding wheels are designed for wet or dry precision grinding applications on the hardest materials. 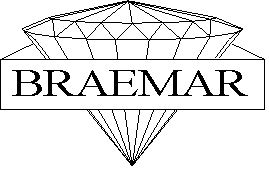 With Braemar Diamond Wheels you get high material removal rates, superior form holding and longer wheel life.Our engineers can design the proper grinding wheel or super abrasive product to your exacting needs.